The shotgun occupies an important place in history, urban legend and in your inventory of personal defense and hunting firearms. It is most typical to find shotguns loaded with shotshells containing anywhere from a single projectile to many hundreds of small lead birdshot spheres. With a slug it is expected to be able to engage targets at 50 yards (45 meters) during ethical hunting and repulse a human attacker at ranges exceeding 100 yards. Buckshot is recommended for self-defense and hunting thin-skinned animals such as deer at ranges up to 50 yards. A lifetime of service can be bought for under $500 with shotguns from makers such as Remington, Mossberg and Benelli. 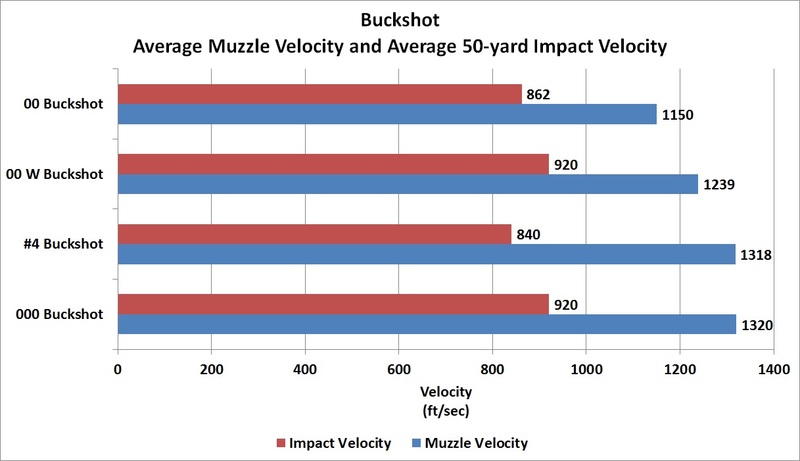 Two factors are in play that make buckshot such a limited range projectile: the aerodynamic properties of the buckshot pellets themselves and the reduction in hit probability as the shot pellets disperse radially outward and away from each other in an increasingly large pattern size. It has been said that “you cannot miss fast enough to win.” Shotguns also follow this rule, despite offering greatly improved hit probability…you must still carefully aim a shotgun if you would like to hit your target. The advantage of increased hit probability compared to rifles comes in during real-world shooting situations where the lighting in your area may not be perfect, the target may be moving and you will be nervous to some extent. Add in to this the fact that most people practice shooting their guns exclusively from a bench at the 100 yard range at their local club. No such shooting rest will exist in the real world, yet people continue to stick to the bench as if their guns won’t work without being rested on a sandbag. While people come to this website for technical information, I would like to use it as a soapbox briefly to preach the importance of practicing shooting your weapon from ‘field positions’ such as prone (laying flat on ones stomach.) 12 gauge shotguns seem to be the world standard gauge for security teams, home defense and military applications. This is likely because most people in charge of firearm selection are able to shoot a full-power 12 gauge load from the prone position. What is normally a ‘brisk’ recoil while standing becomes a ‘where is my nose?’ recoil while firing from prone since all of the recoil of the weapon is expended in compressing the tissues local to your firing shoulder and spinning you slightly in a circular motion on the ground. Long story short … you train as you want to react so that you will react as you have trained. Getting off of the bench allows you to understand your equipment better and allows you to make the appropriate ammo choices. The velocity figures illustrated in Figure 1 were painstakingly obtained by shooting actual buckshot pellets through an actual 12 gauge shotgun, in-between an armored structure called an exclusion screen and over the velocity screens of a Pact chronograph placed at 50 yards distance from the muzzle. Notice the heaviest shot, the 000 buck, lost 30% its velocity while the lightest, #4 buck, lost 36% of its velocity at 50 yards. Of interest is the tie between the performance of the lead 00 buckshot and the tungsten (“W”) alloy buckshot from the Hevi-Shot company. Both shot sizes lost 26% of their velocity. The density of both spheres are the same but the smooth shape of the Hevi-Shot sphere is maintained during weapon launch … leading to lower aerodynamic drag despite the higher muzzle velocity. Velocity only tells part of the story though. The performance of the shotgun can be measured by shooting the pellets into calibrated ballistic gelatin blocks and measuring the penetration depth in this medium. When shooting into 10% gelatin, what is recognized as the ‘law enforcement standard’ gelatin concentration in the United States, I feel that the FBI guidelines of a minimum of 12.0” penetration in such a gelatin block is a good rule to follow. 000 buckshot and 00 buckshot offer adequate penetration at 50 yards distance using standard pressure shotshells. #4 buckshot offers inadequate penetration depths but will still do damage to the narrow shotlines and shallow organs. Although not tested, it is likely that the best performance at 50 yards will be provided by the #1 buckshot shell. The penetration depths will be close to the 12.0” mark and the greater number of shot pellets in the air at one time allows a greater hit probability than the larger shot sizes. Heavier tungsten alloy or preferably tungsten carbide spheres can be used in shotguns to increase the sectional density of the spheres. A cubic meter of lead has a mass of 11,340 kg while a cubic meter of tungsten has a mass of 19,250 kg. This greatly increased density of a tungsten sphere leads to higher velocities downrange with an accompanying higher striking kinetic energy once the spheres find the target. Tungsten spheres are harder than lead and as such are adept at penetrating common urban barriers such as car doors and windshield glass. Heckler and Koch and Winchester teamed up in the 1980s to make the CAWS shotgun, a select-fire 12 gauge weapon firing both tungsten buckshot shells and flechette shells. The reader should read the report for themselves and determine whether the costs of exotic ammunition line up favorably with the performance potential. If a shooter is looking for less indiscriminate damage to the area surrounding the target or desires a longer range shot, slugs may be used. A shotgun slug is a single projectile typically with a flat nose and a very non-aerodynamic profile. This does not preclude taking shots out to 100 yards or further but the terminal effectiveness of these projectiles is greatly reduced much beyond these distances. It has been said that ‘bullseyes don’t shoot back.’ The history of gunfighting seems to bear this out exactly. Shotguns still require careful aim, though the spread of the pellets with distance does offer some increased margin of error over rifles. There are ways to maximize the accuracy of a shotgun and even to improve the hit probability through the use of rifle sights (or red dot scopes) that are properly sighted-in for the weapon the scope is mounted on. A procedure for such can be found here (Sighting in a Shotgun). Rifles dominate long distance shooting but that doesn’t mean that we should not seek out ways to increase our chances of success with a shotgun, should the need arise to shoot further (see full report: Shotgun Hit Probability). As a general recommendation, 20 gauge shotguns are shootable by most people and as such are what I recommend for everyone for self-defense usage. If you have a larger physical frame and are willing to put in the extra practice required to become proficient, there is no reason not to shoot a 12 gauge shotgun. It will likely be revealed through further testing that the 16 gauge shotgun is the optimum balance of felt recoil and terminal effectiveness. The optimum shot size for the 0-50 yard range is #1 buckshot. If you are certain that the distance will not exceed 10 yards, then I recommend #4 buckshot. Under no circumstances do I recommend birdshot for self-defense. Please don’t email asking me to do so. The pellets are too light to penetrate deeply enough to incapacitate a human attacker. A good demonstration of birdshot ineffectiveness is on the video at right.